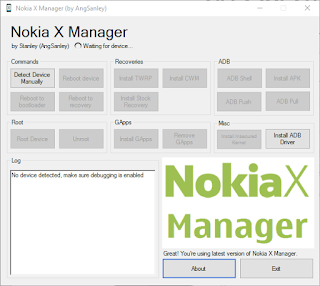 Nokia X Manager is useful software allows you to few stuff with your Nokia phone like installing recoveries, ADB commands, quick rooting and etc. From this you can download the latest version of Nokia X Manager V2.0.0.1. Here we have provided working download link for Nokia X Manager V2.0.0.1. You can start downloading it using link given below. Button based ADB commands, which includes detect device manually, rebooting the device the device, rebooting the bootloader and reboot the recovery. Using Nokia X Manager you can are also able to easily install CWM or TWRP recovery on your Nokia X or Nokia XL mobile phone. This tool also lets you flash stock recovery. With ADB commands feature, you can open adb shell command, istall any application on your mobile and do ADB push or ADB pull commands. 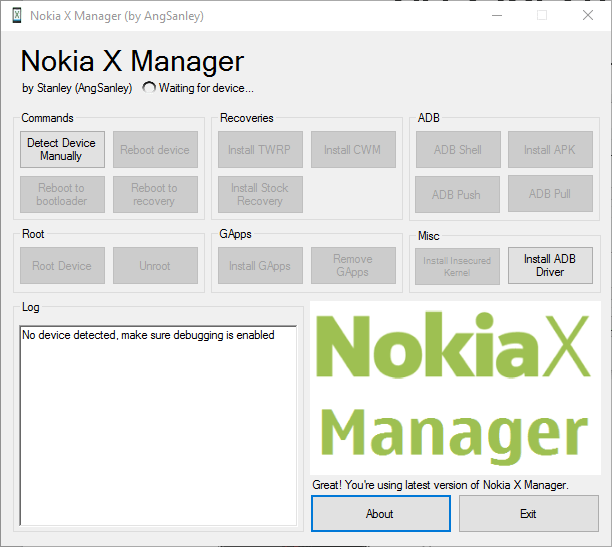 You can now download the Nokia X Manager V2.0.0.1 latest version for windows pc using link given below. 0 Comment "Nokia X Manager V2.0.0.1 (Latest) Free Download"